his Firebush selection comes from the Lynn Lowery collection at SFA arboretum. It is a more compact selection reaching only 5-6′ at maturity. Hamelia patens flowers late spring to early fall. Flowers are bright orangish-red and in clusters. The stems and flower stalks also have a red hue. 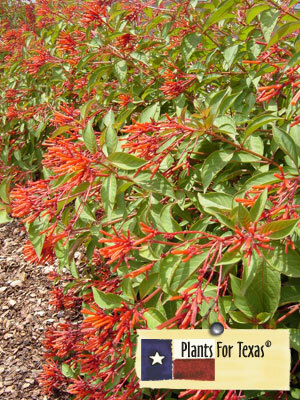 Mexican Firebush is heat and drought tolerant and requires excellent drainage. This plant is also known to be salt and lime tolerant. When in flower and fruit this is a great habitat plant, attracting birds, especially hummingbirds. Hamelia patensis part of our Plants For Texas® Program, meaning it was Texas Grown, Tested in Texas to perform outstanding for Texas Gardens.